Weather: upper 60's to low 70's, no wind. 3 8:48 100 feet of elevation gain here. 5 8:24 Got some decline finally! 6 8:17 More decline! Yes! 8 8:52 Some rolling hills, hurting. 10 8:19 Gel I took at mile 7 or 8 kicked in. Nice work! I chose this race because I wanted to go out with a bang before taking a bit of break from running and racing. I am heading overseas soon and the likelihood of me putting in any quality miles isn't going to be good. I am sure I'll get some in, but I won't be as dedicated as I usually am. 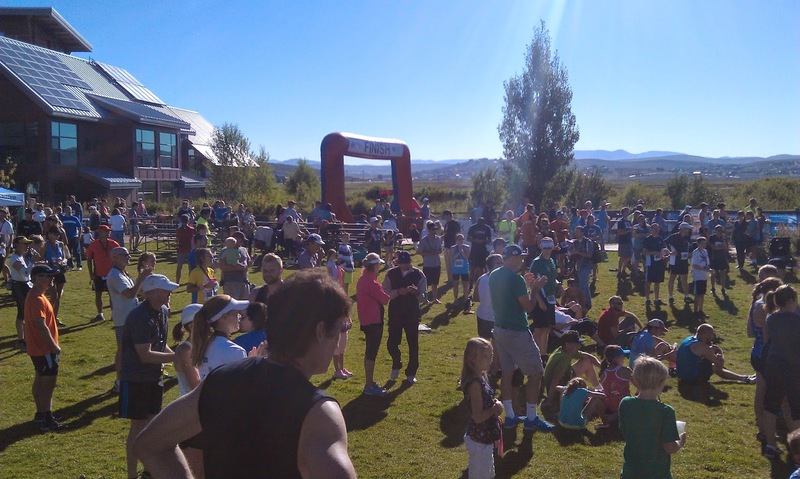 I signed up for the Park City Half Marathon about a day before registration closed. They charged a fair price: $60 and being that it was close to home and excuse to do something, I jumped in. The marathon does attract people from out of state, as there were plenty of visitors from outside of Utah. There were also a handful of Marathon Maniacs there as well. I've been straddling a fine line in terms of running. I am nursing a host of small injuries that are threatening to be show stoppers. 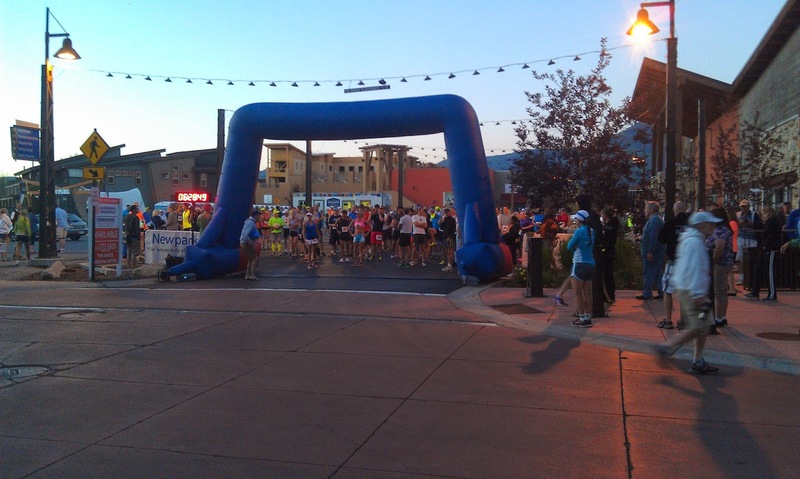 My right knee had been bothering me all week thanks to the Sandy Midnight Moon 5K. As you can see from the picture above, I broke out my Ace knee wraps. It bothered me off and on throughout the race, but nothing too serious. My hamstring which tightens up when I push the pace was an aggravation from mile 4 on. It never got bad either, but it was a constantly reminder. 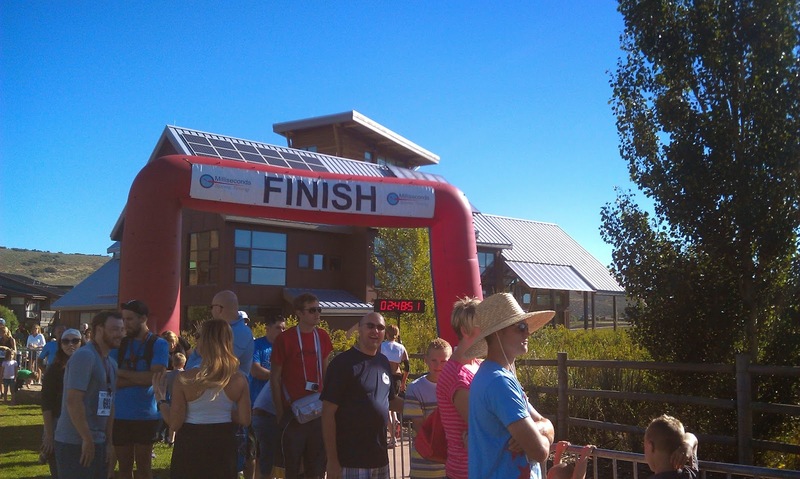 My calf / achilles barked initially but later were quiet throughout the race (good!). I got up around 5AM, ate a bowl of Wheaties and an orange and headed out the door 30 minutes later. 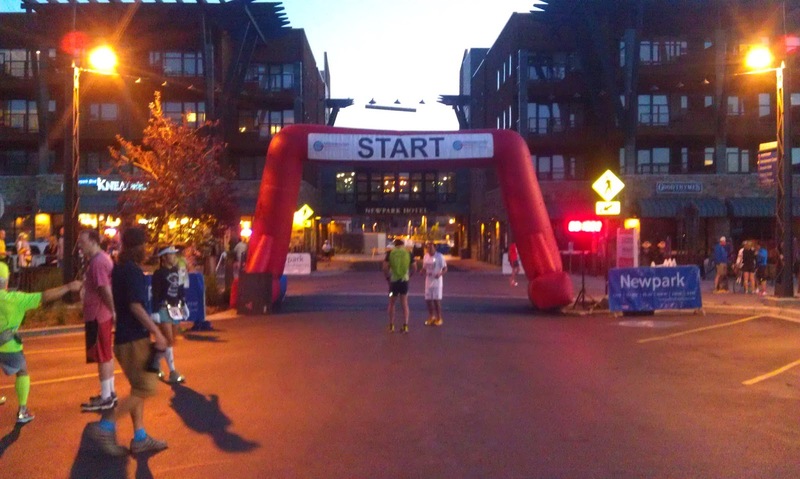 I made it Park City by 6AM and had enough time to wander around and check out the marathoners. There were PLENTY of bathrooms -- never a wait. 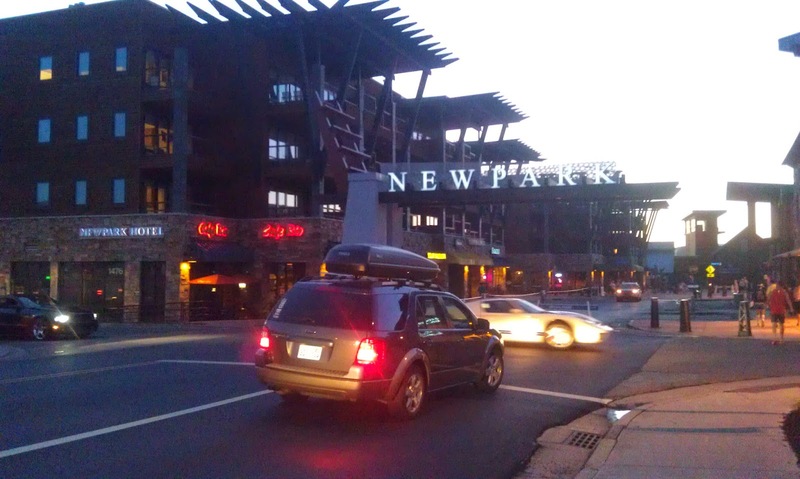 Also out of towners who stayed at the hotel could wander up to the starting line within 15 seconds of leaving the hotel. I would say there were only a few hundred marathoners. I saw a few literally roll out at 6:29 for the 6:30 start. I felt a pang in my heart as I saw them take off, wishing I could join them, but I am seriously undertrained for a marathon at this point. The race started promptly at 7AM and we did a quick tour of the mall / shopping area before running along a service road just above I-80. We were greeted with some rolling hills. I don't remember any being insurmountable but they certainly took something out of you. The hills were 50 - 100 feet in height and while the course formed a loop, it seemed like we were running up hill more than downhill. I knew right off the bat that I wasn't going to place in this race. There were a ton of people and at least a good hundred were ahead of me within the first mile. 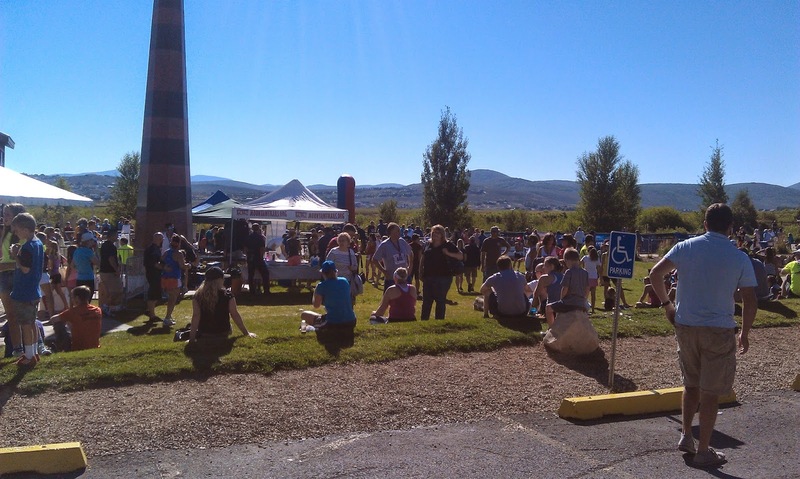 I had the impression there was only going to be a few hundred half marathoners, but they certainly had a good crowd. I felt like for the most part I was running fairly even splits, but all throughout the race I found people passing me. I tried to not let it bother me and while I did start fast I didn't have to crawl to the finish line (although I did have some bad miles when the hills got tough). The course was easily navigable and I was almost never alone throughout the race (maybe the last mile or two the people were pretty strung out). The first 7 miles were on pavement. There was some absolutely stunning views of the Park City Valley. The east side is still largely rural with some nice farm houses that had acre lots. There was a smattering of horses and I really enjoyed the panoramic scenery. The course was a toughie though and I can emphasize enough that it seemed like we were always ascending hills. Also keep in mind that the elevation for this race is roughly 6500 feet. I live at 4300 and if you are coming from the lowlands, you may struggle. After about 7 miles, the course was switched to packed dirt or gravel. It wasn't technically challenging and only a few places I was wishing for the pavement. The last mile and a half was on pavement as we headed back to the race headquarters. The closer we got to town the more the crowds came out -- but overall if you are looking for crowd support, you won't find much here. There were water stops every 2 miles starting at mile 3. The early ones offered gels, Powerade, water and fruit. Some of the mile markers were way off and ultimately I felt the course was short. Just about everyone's Garmin read 13 miles on the button. 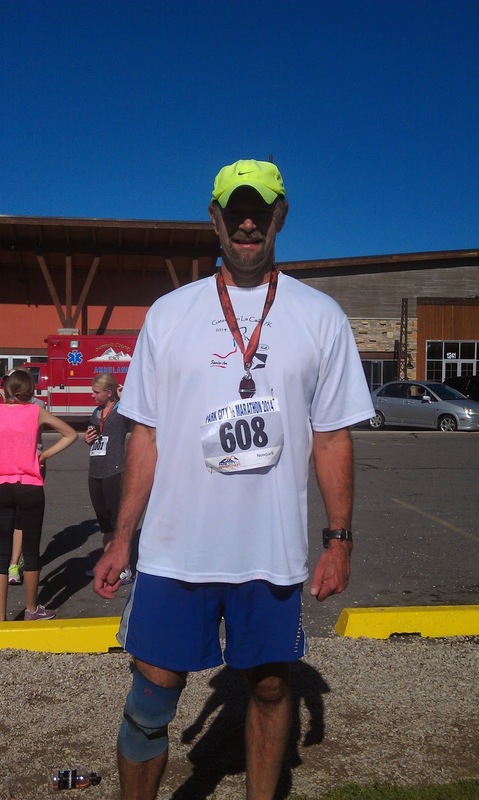 I didn't have any problems running my own pace and the course was never crowded. It was nice to see some of the marathoners who had started 30 minutes before we did making their way on the opposite side of the road early on. 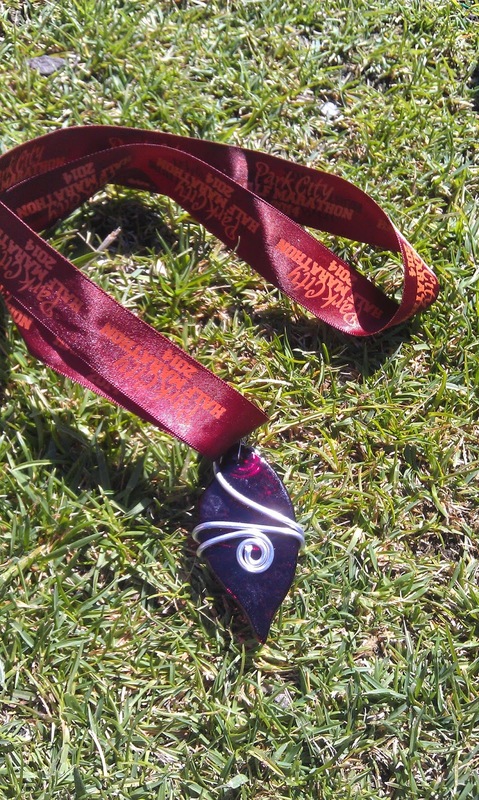 Cool finishers medal. Full marathoners were blue and twice as big. I was pretty gassed when I finished but ultimately I was happy with my performance. At least given my other race results it seems inline with what I am capable of this year. 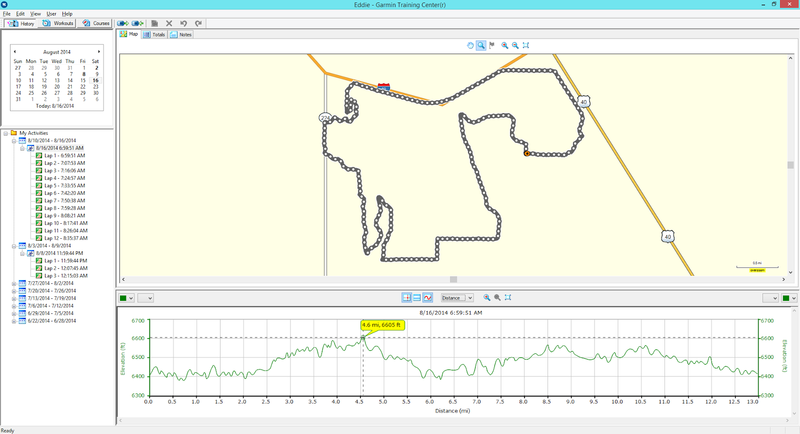 I think if the course had been flatter and lower elevation, I would've turned in a slightly better time. 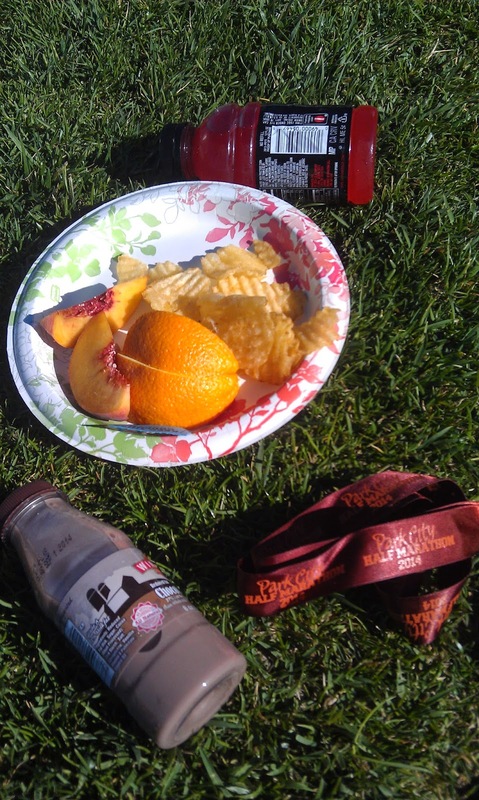 The finish corral was pretty easy to navigate and I grabbed some Powerade, a chocolate milk, and some chips and fruit. It would've been nice to have a bit more food but it sure hit the spot. I hung around a bit as they did some raffle drawings but my number wasn't called. This race is super competitive, as the finishing times were pretty impressive (the winning marathon time was in the 2:30's or 2:40's). However, if you are looking for a smallish marathon / half marathon consider this race. I was able to register a day before closing without any problems or ridiculous surcharges. The race was professionally run despite a few flaws. If you are from out of town, consider staying at the host hotel, your room will literally be near the starting / finish line.